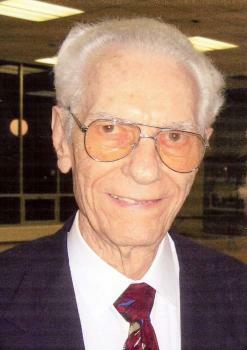 Jack B. Weller age 93 of Friendship Village of Columbus, formerly of Richwood, died late Thursday evening February 11, 2010. Born August 28, 1916 in Delaware County to the late Melvin R. and Ruth (Bailey) Weller, he was also predeceased by his wife Margaret (LeMasters) Weller, whom he married August 2, 1947, she died January 12, 2005. During WW II he was employed by Curtiss Wright Corp. in Columbus building the Navy Helldiver airplane and assisted in the production of the company’s radio broadcast program “Conqueror of the Clouds”. He retired in 1982 after 25 yrs. as a tool and die process engineer at the Whirlpool Corp in Marion. Jack was an enthusiastic bicyclist, golfer and avid sports admirer. Member of the Richwood First Baptist Church and participant in many choral activities and community endeavors, including Lions Club. Surviving is daughter: Gwenyth (Allen T.) Fabian of Westerville, Grandson: Thomas A. (Josephine Kuo) Miller of Marysville, sister: Eileen Weller Stephenson of Columbus and sister-in-law: Mabel Gill, former Richwood resident. His constant love, caring concern and jovial manner will be greatly missed by his small and loving family. Funeral services will be held Monday February 15, 2010 at 11:00 am at the Stofcheck-Ballinger Funeral Home in Richwood, where friends may call Sunday from 2-4 pm, Pastor Joseph Rhea will officiate, burial in the Claibourne Cemetery will take place at a later date. Memorial gifts may be made to the Richwood First Baptist Church at 101 E Ottawa St. Richwood, Ohio 43344 and or the Friendship Village of Columbus Memorial Fund at 5800 Forest Hills Blvd. Columbus, Ohio 43231. I worked with Jack for the 25 years he was there, a good guy to work with! and a good sense of humor, could be tough to deal with at times but never held a grudge. May he rest in peace, and Gods Light shine upon him! Thoughts and prayers go out to you. I worked at the grocery at the time your Dad retired. He would ride his bike out and remark that he was so busy he didn't know how he ever had time to work. I would take from that, he enjoyed his retirement years. He was always a gentleman. Enjoy your memories. We send our sympathies and condolences to you and your family. I saw Jack at my 45th Richwood HS reunion last summer. He was in good spirits and was the oldest living graduate there - - what an honor! That was Jack: an honorable man.